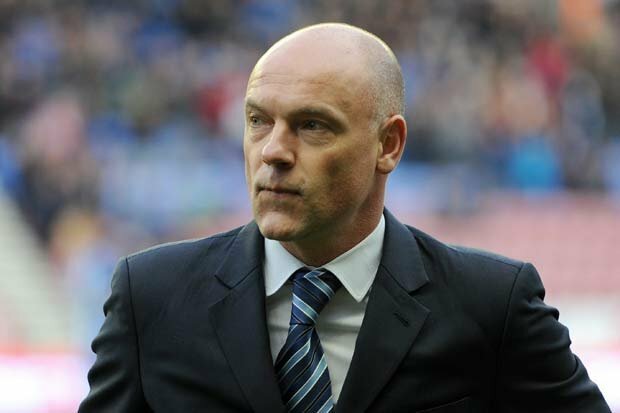 Uwe Rosler continues to enjoy huge support at Wigan, after making such a positive impression last season. He took over a club that was slipping down the Championship league table, taking them to not only the playoffs, but also to an FA Cup semi-final. Rosler is by no means a typical English football manager. He has a style and methodology that places him apart from the rest. Sometimes his approach can be baffling, although fans are finding him easier to read than when he first arrived. In the month of May we reached out to Billy Grant (Twitter -@billythebee99 , who writes for the Brentford fanzine http://www.Beesotted.co.uk (Twitter – @beesotted). Billy was able to give us a fascinating insight into Rosler’s tactics and footballing philosophy. So here are Billy’s responses to the questions we composed for him. First of all I would like to say we at Beesotted have a lot of time for Uwe Rosler. A lot of Brentford fans do to be honest. He came to us at a time that we needed to instil a new mentality into the club. Uwe was very much part of that new mentality. I do believe his work was instrumental in getting us to the Championship. Mark Warburton did a great job in picking up where Uwe left off. It could have gone horribly wrong at that point and Brentford fans would have no doubt felt a little bit more bitter about Uwe’s departure. But it all worked out right in the end. We also have to realise that Uwe was also a relatively rookie manager when he came to Brentford. Yes he had managed clubs in Norway but he was an unknown force in the UK and was still learning on the job so to speak when he started managing us. And he’s still learning now. Wigan fans should remember that. He has taken a step up in division and has so far over-performed so give him a little rope. High pressing is clearly the centerpiece of Uwe’s main tactical ploys. The pressing has worked for Latics in patches but when they have run out of steam they have stopped pressing and also surrendered possession too easily, inviting teams upon them. This is probably fatigue more than instruction, but how did it work for Brentford? Were his teams able to sustain the high pressing for 90 minutes, or would they enjoy possession for periods to “rest” or the break the opposition’s rhythm? Yes Uwe’s tactic was to play the pressing game when he came to Brentford. He introduced playing the ball out from the back and pressing high to a team that quite frankly wasn’t quite used to it. It worked in patches but when it broke down, we were often punished. It was quite amusing as fans used to the blood and thunder of third division football would often be heard shouting from the terraces “Just bloody get the ball up there. Kick it. Forget the fancy stuff”. The players struggled to cope with playing that style of football naturally on an ongoing basis. But they were learning. A couple of seasons later with a few personnel changes and more experience of playing “Uwe’s way”, the team had things pretty much sorted. The season when we lost out on promotion with the 94th minute penalty against Doncaster (2012/13), we often had games where we had over 70% possession. When we played Doncaster at their ground earlier in the season, apparently we had 82% possession at one point. We went 1-0 up but were beaten 2-1 with a Doncaster smash-n-grab. Even their manager Dean Saunders said at the time he had no idea how they won that game. We had loads of possession and were were creating loads of chances but unfortunately our finishing was letting us down. Uwe admitted that was an issue and looked to address that in the close season. Uwe was a stickler for fitness. Last summer he took the team away for a conditioning week in Germany where they undertook an iron man session involving all sorts of body straining and team bonding exercises. The team was infinitely fitter at the beginning of this season as opposed to when Uwe took over. Fitness is a real key to the way he wants the team to play. It’s no co-incidence that he poached the conditioning coach Chris Haslam from Brentford and no one else (as yet .. Let’s see if he goes for one or two of our players in the close season). Chris was instrumental in installing a programme to get the Brentford team in ship shape and Uwe would think him as an important part of the jigsaw in getting Wigan to play the way he wants. Of course Wigan will have some better players than Brentford to an extent. But overall, the principle remains the same. Uwe will no doubt be looking to bring to Wigan what he brought to Brentford. Without a shadow of doubt he feels that he is missing a couple of certain types of player to complete the jigsaw. For Brentford our jigsaw was completed by adding a no nonsense player into the mix in Alan McCormack. a central midfielder-come right back. His impact on the team was phenomenal with him winning him supporters player of the year and Beesotted player of the year awards. And an attacking/wide midfielder option. For us it started with Conor McAleney from Everton but he got injured. Then it was Kadeem Harris from Cardiff but he got injured. Then it was Alan Judge from Blackburn (who joined after Uwe left). The third piece of the jigsaw was a striker and Will Grigg was bought in. Unfortunately, Grigg has not as yet lived up to his potential but we got away with it as we started scoring more goals from midfield. But it’s all about time. A person needs time to deliver results. That’s the problem with football nowadays. There is no long term plan for most clubs. They want everything yesterday. That means there is no real scope for proper development. I’m a person that really believes that the best employees are ones who make and learn from their mistakes. For someone to really develop he (or she) has to be given time to find the right path forward. Give Uwe a bit of time and Im sure he will get your squad in ship shape. Uwe has clearly stated that he believes in squad rotation. Although some just don’t like it, most fans have accepted that it has been necessary because of the exceedingly long season Latics faced. Or is he just a serial rotator? This was one of the biggest issues a vocal section of the Brentford fans had with Uwe if I had to be honest. His player rotation policy. At Beesotted we obviously get a lot of the fan opinion channelled through the website and can gauge the feeling out there. Many people were saying “We don’t know if he knows what his best team is” even at the beginning of this last season. Uwe felt that player rotation was essential to enable to squad to last a whole season. People agreed with him in principal but the argument many had was .. Couldn’t some players have a run of games .. Then get rested as opposed to rotating players constantly? Things really went a bit awry when Uwe decided to rest practically the whole first team away to Derby in the second round of the League Cup. Many Bees fans Had their “let’s concentrate on the league” head on and were a bit dubious of getting into another cup run like we did the season before when we lost eventually to Chelsea. But we took a fair few fans up to Derby on a Tuesday night because we wanted to see Brentford give them a fight at least with a few regulars and some up-and-coming kids in the side. As it was, we went down 5-0 and the fans were really p!ssed off. Meanwhile, the rested players all came back into the side the following Saturday and huffed and puffed to grind out a 0-0 draw with a hapless Carlisle team – one which was getting knocked for 4 and 5 goals every week by the opposition. We then lost 4-0 to Bradford, 1-0 to Rotherham and, worst of the worst, 2-1 to a useless Stevenage side within the next 6 weeks or so. To be fair, Wigan fans should be thanking Stevenage as if they hadn’t beaten us, Uwe would never have be managing their team. After that game, Uwe embarked on an excellent piece of man management. He locked the team in the dressing room for 90 minutes and everyone had it out. It was apparently a no holds barred two-way feedback session. Players could say what they felt about other players. About the manager. About tactics. Anything they weren’t happy with. And vice versa. Whatever was uttered in that dressing room has never been leaked … But the following match, Uwe dropped fans favourite right back Shaelum Logan and replaced him with hard man central midfielder Alan McCormack. Logan was great going forward but could sometimes find himself missing in defensive positions, giving the ball away in key areas. But we were short on right back options and he was deemed too good to drop. More interestingly though, from the following game onwards, Uwe picked a team and stuck with that same team until he left for Wigan two months later. He never lost another match after that in his time at Brentford. In fact, he won them all except a 0-0 draw away to eventual title winners Wolves. What’s more … After Uwe left, we continued the no rotation policy as much as we could bar injuries. As a result, we went on an incredible 19 match 4 month unbeaten run seeing us win 17 games and draw 3 before being beaten by eventual champions Wolves. I can only assume that the right back and team rotation points were discussed at length in the Stevenage dressing room and, fair play, Uwe took them on board. Fans here find it hard to predict Uwe’s lineups and substitutions can be even harder to predict. Granted that much of this might have been down to having to rotate his squad and save players for upcoming matches. Do have any insight into what his rationale might be? Not really. One reason why Uwe used to rotate the team was he would try and adapt the Brentford team depending on the opposition. Many fans wanted him to stick to the same team and let the opposition worry about us. That obviously changed after the Stevenage game when he stuck with the same team week in and week out. To be fair to Uwe, he would often change the team quite radically as well as the tactics if it was not working in the first half. More often than not, this has proven to have positive results with the changes turning the game around. His teams were also known for fighting till the very very end. Brentford were well known for scoring important goals very late in the game – this I believe was down to the team’s increased fitness levels that Uwe insisted on, an incredible team spirit within the side fostered by Uwe and an alteration in the team, formation and or tactics. Uwe’s masterstrokes were becoming legendary. At Loftus Road in the playoff semi final we saw the hoof once more rear its ugly head. That was what fans might have expected more from Coyle’s teams than Rosler’s. Over the past months it has become more and more prevalent. A measured long pass is one thing, but hoofing forward speculative high balls to the opposition defence is something else. It could have been a symptom of mental tiredness on the part of the players, but did Uwe manage to keep a lid on it when at Brentford? We saw a bit of both at Brentford. There was the total passing game which was interspersed with a long ball game. In division one, Uwe learned that pretty football did not always get you the results you wanted. Long ball was sometimes effective for Brentford although after three seasons of seeing our style change, many fans would get p!ssed off if we resorted to a long ball game. We had a striker, Farid El Alagui, who was a big fans’ favourite who used to attack aerial balls and chase everything down with a passion. Unfortunately, he got injured early on in the “Doncaster” season and when he came back a year later at the beginning of the promotion season, our football style had changed somewhat. Brentford were beginning to rely a lot less on playing the long ball game. Farid was reduced to an occasional substitute. Ironically, in quite a few games he came on in, he managed to switch the game up and score. Brentford fans wanted to keep Farid as an option so that we could switch to a “B” plan which involved playing a more direct style of football. But he was used less and less and eventually was loaned to Dundee Utd just after Uwe left. I was actually at Loftus Road in the Wigan end for the QPR game with Laney the Beesotted founder. Uwe kindly sorted us out match tickets. We blame ourselves for Wigan losing. Brentford have a terrible record in the playoffs – losing every 7 of the playoffs we have been in – so I’m surprised he let us anywhere near the match with our dismal playoff record. Saying that, Uwe is totally practical when it comes to superstition not believing that past Brentford’s failures should have any impact on current games. I think he may take a different view after we lost to Yeovil in the final once again last year and our jonah appearance at Loftus Rd. My personal opinion was with so much at stake, Uwe probably played it a little bit too cautious at QPhah. It reminded me of some games at Brentford back in the day. Lots of good skillful passing play. Getting the ball up to front men quickly who are unable to deliver. Giving the ball away in midfield needlesslessly at times. Quite frustrating as naturally, we wanted you guys to win. But his argument will be – Wigan were playing away from home so you keep it tight and hit the opposition with a sucker punch and all of a sudden they’re chasing you for the game. That’s when you switch it up in the last 20 minutes with substitutions to expose those gaps. Unfortunately, it didn’t quite work that way. How successfully did Uwe use the loan system at Brentford? Things did not work out well for him here with many of his loan players. Not one of them appeared in the starting lineups in the two playoff games. What proportion of loan players “made it” at Brentford. How many were later to sign permanent contracts? Brentford have a wicked loan system. We have a sporting director who’s main role is dealing with the player side of things. Current manager Mark Warburton was sporting director when Uwe was manager. The two very much worked as a team. Who actually found specific players we signed I cannot say for sure. But as Warburton’s background and passion is developing youth team players, I can only assume that it was he who developed relationships with a number of premier league academies as he created the NextGen series (sort of the champions league for academy teams). As a result I can then assume that he recommended the signing of young Everton academy players Luke Bidwell, Adam Forshaw (league one player of the year this season) and Conor McAleney, as well as players like Harlee Dean (Southampton), Kadeem Harris (Cardiff), Tom Adeyemi (Norwich) and Marcello Trotta (Fulham). I may be wrong though. Bidwell, Forshaw and Dean played a good season or so on loan for the Bees before becoming permanent signings. Adeyemi was great for Brentford in the “Doncaster” season and we tried to buy him in the summer. We would have got him if we got promoted but Birmingham waded in and promised him Championship football so he left for them. We’re still trying to sign Trotta after he matured massively after “crossbar-gate” in the last league game of last season. He’ll probably end up at Wigan as will George Saville (Chelsea) who had a great debut season for us and Uwe tried to sign in the January window. We tried to sign him too but he’s going places and has already said his farewells to Brentford after the team’s promotion holiday in Vegas. The policy Brentford has is to pick up players with great potential but still needing a lot of developing. Then give them match time and try and sign them from the parent club on a deal which gives the club a decent sell-on clause. Matthew Benham the owner also keeps an eye on what is happening in the transfer market and, as he owns a company which analyses football data of players worldwide, he occasionally throws in suggestions of players Brentford should look at. But it is ultimately down to the manager and sporting director to see whether these players fit into the squad. We did have a number of duff loan and permanent signings too. Paul Hayes comes to mind as a striker with potential that just didn’t work out. His fitness levels were apparently incredibly poor and his work rate wasnot up to Uwe’s standards. He was on decent money too. it’s no secret that him and Uwe fell out. He was banished to the development team, trained on his own at stages and was loaned out to Plymouth and Crawley. We ended up having to pay him off as no one would even take him on loan for any period of time. Bradley Wright-Philips I feel was also a disappointment. Yes he scored a last minute equaliser up at Bramall Lane when we were down to 9 men which will always be remembers for years to come as one of the great Brentdord matches .. But the reality is if he had scored more goals in his loan spell at the end of “Doncaster” season we would not have had to rely on Marcello Trotta to score that 94th minute penalty to get automatic promotion to the Championship. Czech striker Martin Fillo played for Uwe in Norway. We signed him on a season-long loan but he didn’t make the grade. Maybe this was a reflection of the standard of our division where players who looked great playing in the Norwegian league, couldn’t even make the bench in a Division One side. Lesson learned for Uwe there. This last season, the decision was made that the manager, sporting director and owner had to agree on all signings. That I believe helped to ensure there we maximised the potential of all our signings and didn’t repeat the Paul Hayes mistake. So to answer your question, Uwe played the loan system very well at Brentford. He had a great team of people to work with to make sure the right decisions were being made and to bounce off. Something he will need at Wigan I reckon. What is Uwe’s transfer market style? Where does he like to shop? Is he willing to splash cash either on transfer fees or wages for the right players? Obviously Wigan has a bit more money than Brentford, what sort of signings should we expect? This is a toughie. I can’t be sure who initiated the decision to bring in particular players. I do know for example Uwe was incredibly keen on Marcello Trotta. When we failed to get promoted, Uwe wanted to bring Marcello back but for various reasons, it was decided that was best if we looked elsewhere. When the season started, we we still short of a striker and to make matters worse, Conor McAleney got injured within the first month. We tried desperately hard to bring in a striker before the deadline but were turned down repeatedly. After the deadline closed, Uwe then requested he bring Trotta back from Fulham on loan and the wish was granted. The move was met with anger from a large section of the Brentford fanbase (I will be quick to point out that Beesotted was behind Trotta’s move back to Griffin Park from day one). Trotta went on to show what a great player he is by putting in a shift and scoring some crucial goals for the team this season including the one away to Orient in mid March which, in effect, sealed our promotion to The Championship. That was an incredibly brave move by Uwe. But he believed in Trotta and wanted him to prove to people what he was capable of. Yes he’s still green and makes mistakes but he’s young and is developing. We’re currently trying to sign him but I wouldn’t be surprised if he ends up at Wigan if Fulham decide to cash in on him. Uwe likes to give younger more enthusiastic players a chance to grow with him. Interesting that he pulled Rob Kiernan from Southend and put him in your team (Rob was at Brentford on loan last season and we were meant to be getting him on loan in January but it fell through much to our disappointment). I was very surprised he let Dicko go though. I seriously thought Uwe was going to send him to Brentford when he pulled him from Rotherham or keep him. He was just the type of player we needed. I was gutted when he went to Wolves. I believe his signing turned their season as they were third and we were top when they signed him. 13 goals in 16 starts says it all. I feel Uwe would be prepared to splash cash if the player is right. But he won’t go overboard Harry Redknapp-stylee as he believes every player has a value and that should adhered to. He bought Northern Ireland striker Will Grigg for £350k plus which was big money for us. He scored 20 goals from Walsall the season before. So far he hasn’t quite worked out for us but it will be interesting to see how he fairs in the Championship. Uwe has used a variety of tactical formations here at Wigan, using either a conventional back four or a line of three central defenders and wing backs. Did he have a preferred team shape at Brentford? Uwe would often switch formation during the game. But we would normally go for four at the back, four or five in the midfield and one or two up front. normally 4-5-1 away from home. Or maybe 4-4-1-1 with a player in “the hole”. Then some time during the game we would switch to a traditional 4-4-2. But we have never played with three centre backs as far as I can remember. Sometimes a player would drop back from midfield and play deeper just in front of the centre backs. Uwe also believed massively in wing backs with Jake Bidwell and Shaelum Logan (who was then replaced by Alan McCormack) careering down the wings. This season, we have been playing a lot of games 4-4-3. I have a feeling Uwe instigated the 4-3-3 switch post Stevenage when we brought in Kadeem Harris to bomb up and down that left wing. But then I can’t be sure. It’s been a long season trust me. One last question – squad discipline. Did Uwe have to deal with anything such as players drink driving or causing trouble. Any public reprimanding? There were a few incidents I know about but I would rather not repeat them in public. They were obviously kept under wraps for a reason. Some things are best held down in order to maintain the equilibrium within the team. But a job of a manager is to manage a team of individuals. And that will involve making some tough calls. There were dressing room politics and personal battles at Brentford for sure. That will be the same in any team. How the manager deals with it is the important thing. The Stevenage dressing room lock-in allowed a number of issues that were festering to come out. It obviously did the job as we went on a 19 match unbeaten run after that. That to me was good man-management. From what I can gather, Uwe was an incredibly firm but fair manager. He wanted things done his way and he would be meticulous in ensuring that that happened. He was a big believer in team spirit and bonding. That’s why he took the team over to Germany two seasons running for a training and bonding exercise. The fans were invited over to stay in the team hotel the first season as Uwe felt that having the fans and team bonding together was an important exercise in the club moving forward together. Needless to say, this move went down incredibly well with the fans who felt that the team hadn’t got “too big” for them. It was not Uwe’s style to publicly reprimand any player. Some of the stuff we have heard that has gone down behind closed doors would have definitely been made public by certain managers. But Uwe preferred to keep a lid on it. And even at times blame himself or himself and the team together for things when they didn’t go to plan. Which was a refreshing change to our previous manager Andy Scott who week in and week out used to blame the players for any failings without criticizing himself occasionally for poor tactics or team selection. The final thing I would say about Uwe is he is still learning. He will make mistakes but he puts his hand up and readily admits that. But if the club allows him to grow with them, he will make a great manager. I personally don’t believe he has quite finalised his staffing issues. I reckon he will bring in a few more people around him so that he has his own team to work with – just like he had at Brentford. We were all surprised that Alan Kernaghan didn’t go with him at Christmas. Maybe he will be on the way in the summer. Lovely bloke is Alan. But I say Uwe really benefitted from Brentford’s Sporting Director system. It took a lot of pressure off him as a lot of the work for finding and delivering players was being done by a man who’s full time job it was to build relationships with key clubs and unearth and present players for possible additions to the squad. I wouldn’t be surprised if Uwe was talking to Whelan at this very moment about poaching one of the premiership academy coaches for this very role.